Parsnips are a very underrated root vegetable. Grown and cultivated throughout history for its creamy texture and sweet flavor, parsnips are an excellent root vegetable to grow and store for the coming winter months. 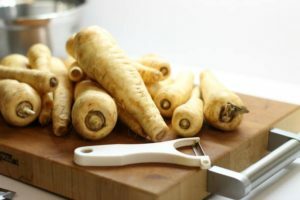 Closely related to the carrot and even parsley, this white root vegetable has the tendency (as do beets, turnips, etc. ), to sweeten in flavor when exposed to cold temperatures. First introduced into North America by the British, this hearty vegetable was used as a staple starch until potatoes became more popular. 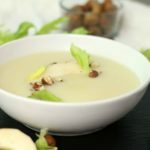 While parsnips are no longer as popular as in years gone by, it is still very delicious when roasted and served as a side, or turned into a soup, such as this creamy parsnip soup with hazelnuts and pear. Parsnips where used as a sweetener in Europe before the introduction of cane sugar, and it’s naturally sweet flavor makes this healthy root vegetable soup the perfect candidate to pair with fruits such as apples and pears, (apples may be substituted in this recipe if you prefer). 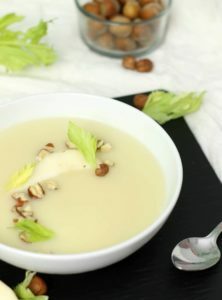 The hazelnuts create a rich nutty flavor and gives this creamy parsnip soup a delicious aroma. The soup is lactose free, and gluten free, making it an ideal addition to anyone wanting to eat cleaner or a paleo diet. Personally, I love cooking with clarified butter, ( which is lactose free). Clarified butter is not however considered to be paleo and as such if you want to make this parsnip soup paleo friendly, simply use coconut or olive oil instead. 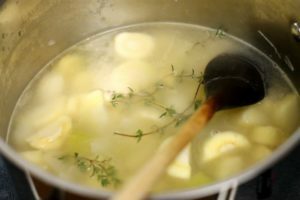 As with most soup recipes that I make here on the blog, start by sauteing the chopped onions, garlic, celery, and parsnips in one or two tablespoons of oil or other fat. Start the vegetables on a medium heat, to prevent the from scorching. To make this creamy parsnip soup and keep it as “white” as possible, you only want to soften the vegetables, and enhance their flavor by sauteing. You want to avoid caramelizing the parsnips as this changes their flavor. Once the parsnips are roughly half cooked (about 10 minutes or so depending on the size of the cut), add the pear, fresh rosemary, and the chopped hazelnuts to the pot. If possible grow your own fresh herbs indoors for year round access to the freshest herbs! Give the pot a stir and make sure nothing is stick8ng to the bottom. If the parsnips do start to stick, your heat is to high. Simply lower the heat and deglaze the pot to loosen stuck on peices. Deglazing the pot is traditionally done with wine, any dry white wine will work well for this creamy parsnip soup, but if you want a.paleo or alcohol free option, simply use water or some chicken stock! Add the rest of the chicken stock to the pot and bring the parsnip soup to a simmer. You can use a digital food thermometer to reach 180C (the textbook temperature which equals simmering) or simply watch the soup pot until very small bubbles start to break the surface. Cover the creamy parsnip soup with a lid and simmer for thirty to forty minutes. The goal here is to infuse all the flavors, finish cooking the parsnips,and cook the chopped hazelnuts until soft. If the hazelnuts are still hard and crunchy, the finished soup will not be smooth and creamy. Simmering the hazelnuts in the parsnip soup with help soften their flesh allowing them to be purred completely. After the soup has simmered and all the ingredients are soft and kind of breaking up on their own, it’s time to puree the parsnip soup! You have several options in terms of equipment to achieve a silky smooth and creamy parsnip soup. A Vitamix blender is of course the best option here but can be pricey. It’s best to buy a Vitamix blender on sale (Affiliate Link) or at a discounted price such as during holiday sales. A food processor will also work well, though you may need to strain the parsnip soup through a Chinois (Affiliate Link) or other fine mesh strainer to get that silky mouth feel. I don’t own either a Vitamix or a food processor, and instead use Ninja-bullet Blender. The only downside here is that the parsnip soup needs to be pureed in batches. When serving this soup to clients at an in home dinner party, I always ensure to strain the soup for the smoothest texture possible. Once you’ve pureed the creamy parsnip soup, pour it back into a clean pot and re season with salt and white pepper. Serve the soup hot, and garnished with crushed hazelnuts, grilled sections of pear and celery heart leaves. If you don’t have celery leaves on hand, fresh homegrown sprouts can also be used! When it comes to garnishes always try and use ingredients already present in the dish to keep within the flavor profile and enhance the visual appeal. Peel and chop the parsnips, and other vegetables. 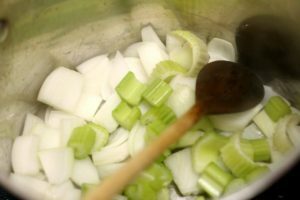 In a soup pot, heat some clarified butter or other fat, and cook the vegetables on low until the onions start to turn translucent. Add the garlic, herbs, and hazelnuts to the soup pot and cook for 4-5 minutes. Add the chicken stock to the creamy parsnip soup, and simmer on low for roughly 40 minutes with a cover on the pot. Once the parsnip soup has simmered, all the vegetables and nuts should be nice and soft. Fish out the bay leaf and thyme. Using a Vitamix, food processor or other blender, puree the creamy parsnip soup until completely smooth. At this point season the soup with salt and white pepper. Garnish the soup with crushed toasted hazelnuts, fresh pear, and celery leaves. I love cooking with clarified butter, (which is lactose free). Clarified butter is however not considered to be paleo and as such if you want to make this parsnip soup paleo friendly, simply use coconut or olive oil instead. Parsnips ARE underrated! I don’t know why people don’t use them more. This recipe is so seasonal, I love it. I can get every ingredient locally right now and it looks delicious – love the addition of the hazelnuts. I’d love to hear how it turns out if you make it! It is very easy to do! A great starter recipe so to speak! I agree that parsnips are underrated, and now I’m wondering why. I don’t seem to be able to eat potatoes lately, so I should try eating more parsnips instead! I’ve pinned this recipe to try. Awesome! We have been slowly cutting back on the amount of starchy veg we eat as well(rice potatoes etc) …this is a great new addition!